False eyelashes shouldn’t be intimidating or reserved for New Year’s Eve bashes. Finding the right falsies based on your eye shape can enhance and open up eyes for a natural look that’s wearable daily or for special events. Not every eyelash is equal. Individual eyelashes are great for a more natural look since you can add a few to the corner of your eye, but they are harder to apply. If you’re a novice, stick with full strips until you feel comfortable trying individual lashes. Synthetic materials are durable and an ideal choice for people who don’t want lashes made from animal hair. Look for synthetic styles with fine, natural-looking lashes (thicker strands often look unnatural). Mink, which is more expensive, is a popular option with celebrities because it tends to look much more natural. Silk strands are another popular option; they can be created just as fine as real hair and their inconsistency can make them look more authentic. Shop for styles based on your eye shape. Lashes that are thicker in the outer corner appear to lift and lengthen smaller eyes, while lashes that are thicker in the center open eyes that have little or no crease. Find your eye shape below for the perfect pair of falsies. Almond eyes are wider in the center with pointed corners. Most lash styles look great with this shape, but full styles with evenly distributed lashes work best. Look for curled lashes to lift the upper lid and create more shape. Voluminous styles can be too heavy and cause round eyes to appear smaller. If your upper eyelid is hidden, full lashes with fluttery layers are most flattering. Concentrate lashes on the outer corner only to make eyes appear further apart. Dramatic long lashes are best for deep-set eyes with a prominent brow bone; shorter styles can get lost. If your eyes appear to protrude out of their sockets, choose more subtle lashes to reduce the definition of your eyes. Styles with volume and length on the outer corners enhance the beauty of eyes that have outer corners that point higher than inner corners. Create a lifting effect by choosing winged styles with length in the outer corners. When opening a new package of lashes, remove the lash strip and wiggle it slightly to create a bend. If it feels too stiff, wrap it around your finger or brush to create a curved shape. This will help it conform to your eye shape. Apply eyeliner and mascara prior to adding the lashes; the mascara will help them adhere to your natural lashes better. Full lash sets can be cut into individual lashes for subtle enhancements. Dip a cotton swab in oil-free makeup remover and gently rub it along the lash line until the lashes loosen and fall off. Avoid using products with oil; it will make it harder for the glue to adhere if you try to reuse them. 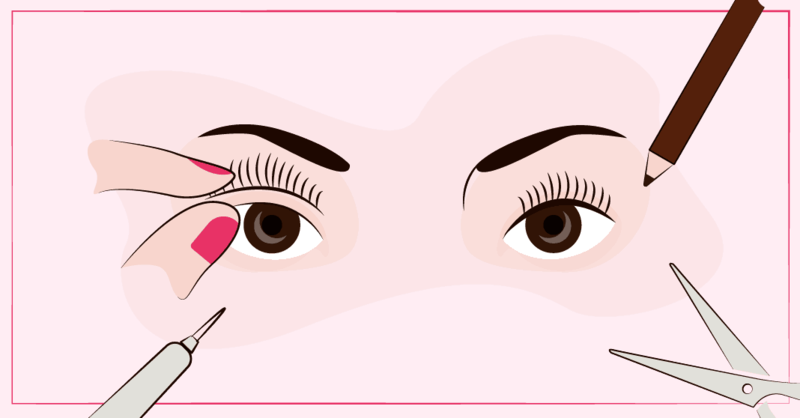 Use tweezers to remove any residual glue and eye makeup remover to clean the lashes. Store in a clean, plastic container or the lash case they came in. Even if you don’t wear eyelashes often, saving and reusing them trims your beauty budget and doesn’t require lots of extra maintenance. The amount of wears depends on the material and how you take care of them. Lashes made with natural animal hairs tend to last 20 to 30 wears; synthetic lashes can last three to eight wears. Thicker bands can also last longer than thinner bands. To make lashes last longer, remove with makeup remover instead of tugging them off. Apply mascara before you apply falsies; mascara buildup will reduce the lifespan of your lashes. Whether you use eyelashes daily or save them for special occasions, these tips can help make eyelashes look natural and enhance your features.